When you’re doing housework, there are so many sounds that are associated with the process. The vroom of the vacuum, the sound of running water as you clean out the sink or shower, swish of the washing machine, the tumble of the dryer, and the churn of the dishwasher. Oh wait…I don’t have the churn of the dishwasher or the swish of the washing machine. When we bought our home, I knew that there were certain appliances that I was going to replace sooner rather than later. I had decide d to bring my refrigerator, stove, and deep freezer with me. We took the refrigerator and stove that came with the home and swamped them with our old. I had only had the refrigerator for about three years and I loved it. My range is a convection/convention oven and I bake a lot. You don’t get rid of a convection oven when you bake a lot. PLUS, the appliances that came with the house were white/beige and I don’t want to have anything to do with white after having a white cabineted kitchen. Since we moved a week before Christmas last year, we began looking for a washer and dryer right around the time of Black Friday and all of the Christmas deals. My husband actually spent several hours in line on Thanksgiving/Black Friday to get us a good deal on a set. I don’t do Black Friday, never have, but if it could help me get the washer dryer I was all for Mr. Stan standing in line. I later found out that he was in line to purchase a front loading machine something that I did not want. Thank the Lord he didn’t get it, I would have been totally unhappy. You may wonder why I didn’t want a front loader…I wanted to be able to stop the cycle at any time if I needed to. I have not heard of a front loader that would allow that. Anyway, I found what I wanted in a top loader made by GE. Now for my dishwasher. … When I first looked into the dishwasher I noticed that it had some “burnt” prongs (the things that hold the dishes). Again I knew that I was going to replace my kitchen appliances, so I felt I could put up with the burnt prongs for a year. The only problem was that the prongs started falling off. 😦 I thought, “that’s okay, it will be fine”. But soon, so many of them fell off that it became hard to hold the dishes. I told Stan, you gotta do something about it and he told me to go to HH Greg and pick something out. I swear I love it when he does that. It makes me so giddy. 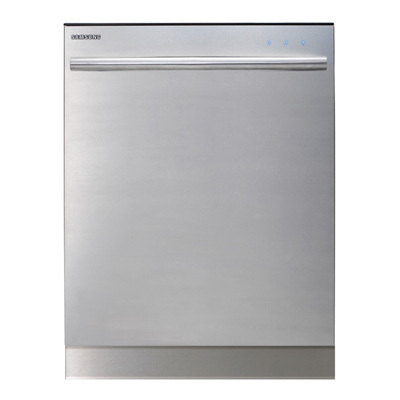 I went to the store one day during lunch and picked out this awesome Samsung dishwasher that was normally $900, but was open boxed for $689. I called my husband and told him the good news and he told me that he hadn’t planned on spending THAT much. What did he mean by that? This dishwasher was top of the line, stainless steel interior, hidden buttons, and supposedly uber-quiet. The salesperson told me to wait until the weekend because it there was a sale going on. When we showed up that weekend, I guess my husband had an epiphany because when we were looking at the dishwashers, he finally told me to get the one I wanted because he didn’t wasn’t going to be the one using it. That had always been my thought, he just hadn’t been thinking that way all week. I picked the stainless steel dishwasher that was on sale, it had a stainless steel interior, hidden controls on the top, and it was supposedly quiet. I didn’t pay attention to the model or maker, just the price, appearance, and features. When it was delivered the following week (yes I had to wait a week), I finally looked at the make and guess what? IT WAS A SAMSUNG!!! When I ran the first cycle I couldn’t believe how quiet it was!!!! You don’t hear anything. I have to look at the three lights to see what part of the cycle it is on. I LOVE IT!!!! And the cherry on top is my refrigerator is a Samsung so I am now one more appliance closer to having matching appliance makers. I’m not promoting any specific brands, these are the items that I have in my home. I LOVE THEM AND I WON”T BE GIVING THEM BACK! 😛 I love not hearing noise when I’m doing these particular chores. With my family room right off the kitchen a loud dishwasher can really ruin tv watching and I can leave the laundry room open and hear nothing. Now if I could just figure out a way to program that water softner so that it regenerates in the middle of the night instead of Monday at 4. Tell me, do you have any uber-quiet appliances?